Your committee finds there is a critical need for long-term care facilities both in the Kaneohe community and at the Hawaii State Hospital. The State Hospital Master Plan includes a public-private partnership which will construct a 250 bed care facility in two phases. This long-term care facility will be built on State Hospital property located at the end of the Windward Community College campus great lawn. The Windward Community College has expressed concern that building the proposed long-term care facility at that location will impact the architectural integrity of the Windward Community College campus. 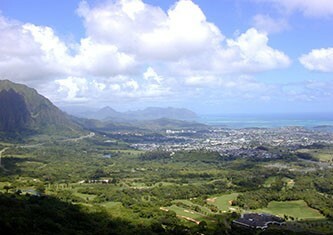 The Windward Community College has proposed a land exchange of a college owned parcel of approximately 5 and half acres located adjacent to the Windward Comprehensive Health Center and the five-acre parcel located at the Kailua end of the college campus. The proposed land exchange was first suggested in an email from Dr. Dykstra to Dr. Fridovich posted on 4/3/13. The April 11 response from Dr Fridovich stated the HSH would not pursue a land exchange option. Nothing more happened till March 2014 when DOH requested a meeting to discuss the land exchange. That meeting was not documented, but the result of the meeting was the rejection of the land exchange proposal. At the presentation of the Master Plan to the Kaneohe Neighborhood Board on May 21, 2015 Dr Dykstra pointed out how the planned location of the long term care facility will affect the Windward Community College and he recommended a land exchange which he believes would be beneficial to the Hawaii State Hospital, to the College and to the Kaneohe community. On June 22, 2015 the DOH sent a letter to John Morton, Vice President for Community Colleges stating that “The Department of Health (DOH) Administration has reviewed the offer and has decided that it is not in the best interest of the Hawaii State Hospital (HSH) to relinquish any land to the WCC” See References and Documentation for a full copy of the letter. In verbal communication with Dr. May at a PIG meeting held on September 1, he stated that the Hospital has a critical need for long-term care facilities and a delay would be intolerable. Dr. William May (Hospital Administrator) and Dr. Mark Fridovich (Adult Mental Health Administrator) stated that the approval process for the project had taken several years to get to the current status and that changing the plan would set the project back several years because it will require a new construction plan be developed before a long term care facility could be built on the Sherwood Forest Parcel. They emphasized the serious crowding of the Hospital and the critical need for more beds. They also mentioned that the distance to the suggested site would make it more difficult for Hospital staff to care for the patients. Phase 1 of construction will provide 150 beds of which a third will be available to the Hawaii State Hospital to care for elderly, low threat, patients who no longer need the level of care and security provided by the Hawaii State Hospital. The long term care facility will be designed to stair-step down the slope of the great lawn. Construction will require the demolition of the Bishop Building. Dr Dykstra stated that when the Bishop Building was closed five years ago the building was structurally sound. The building has not been maintained since its closure. The best information we have concerning the current structure of the building is some aspects of the building may in some respects, be sound (e.g. foundation and walls). Some aspects of the building may render it fundamentally unusable for any purpose (e.g. materials used in construction would not be permissible now [lead paint and asbestos]), some aspects of the building may require extensive renovation (e.g. roof, windows and doors, fixtures, sprinkler system, etc). The Bishop Building is considered a historic building. The State Historic Preservation Agency required that before the building is demolition it must be documented by an architectural historian. The documentation consisting of recording building details both photographically and in architectural drawings. That record has been completed and HSH has received approval to proceed with demolition. Because of the stair-step design of the planned long term care facility, the building will be largely a two-story structure. Hospital patients will be physically separated from patients from the community. Your four-member committee ended up being a two-person committee consisting of John Flanagan and Bill Sager. 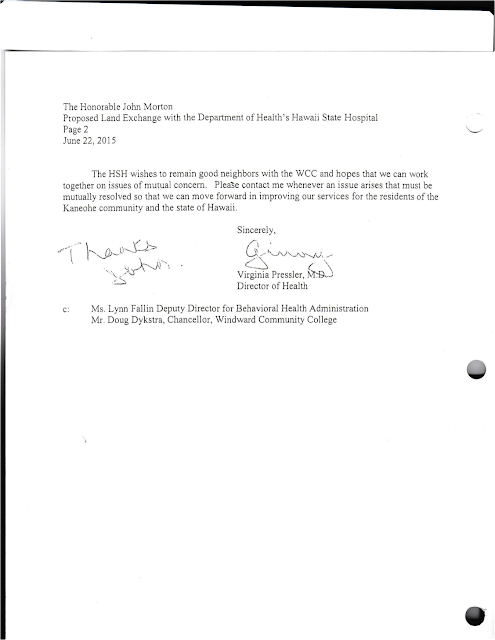 The Hawaii State Hospital and Windward Community College are major contributors to the economy of Windward Oahu. They are the second and third largest employers after Marine Corp Base Hawaii. How these two State Agencies work together and develop in the future will have significant impact on Kaneoheʻs future. 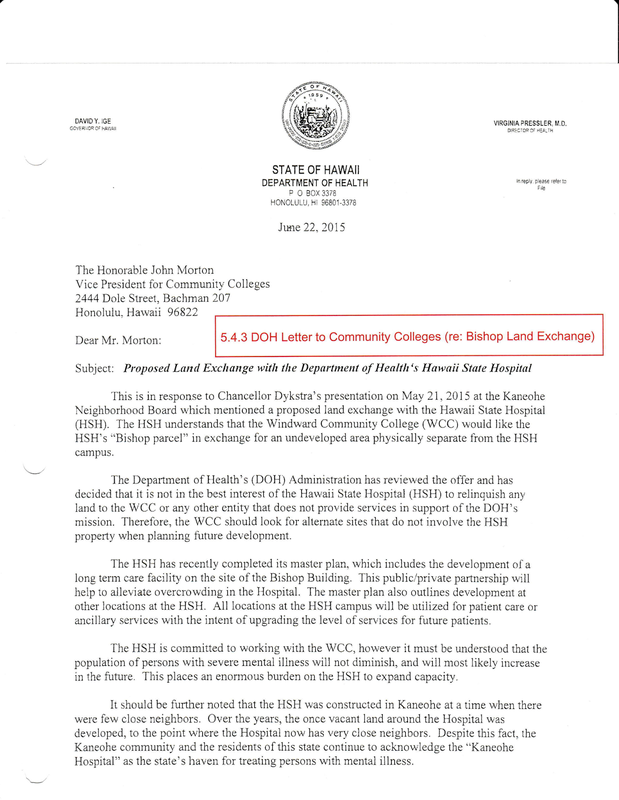 The Hawaii State Hospitalʻs position on the proposed land exchange is “that it is not in the best interest of the Hawaii State Hospital (HSH) to relinquish any land to WCC” The Master Plan is complete and no change will be considered. The Windward Community College position is that construction of the long term care facility as planned in the HSH Master plan will seriously impact the logical future expansion of WCC and will significantly impact both the esthetics and functionality of the Great Lawn which is a key architectural element of the WCC campus. If the WCC was to acquire the HSH parcel, their vision is to repair and maintain the Bishop Building and build an additional building on the makai end of the parcel which would be aligned with existing buildings and which would protect the integrity of the great lawn. This was the earlier effort to pursue a swap, but as you can see Dr. Fridovich preferred not to follow up. We were considering the forested parcel at this time, but it was not on the table yet and as you can see discussions were discouraged by this e-mail until March of 2014 when DOH asked for a meeting where we did put the forested parcel on the table. I do not have any direct communications about the rejection of that offer, however. But we will not be pursuing this option. Mark A. Fridovich, Ph.D., M.P.A. My boss, John Morton is enthusiastic about the possibility of finding an acceptable land swap for the long term care facility. He has asked how important proximity of location to the State Hospital would be. My guess is that proximity is preferable, but not essential, although I am pretty sure a location on O'ahu would be essential. Since I would prefer not to give John a guess I am asking you if you could give me some guidelines on this? This is the Historic Bishop Building slated for demolition to make room for the long tern care facilitiy. This is the extension of the Windward Community College Great Lawn onto Hawaii State Hospital Property. A corner of the Bishop Building is in the extreme right of the picture. Visualize a two story building extending down the slope to the makai road. The right curb is the boundary between the Windward Community College and the Hawaii State Hospital. The long term care facility will be built on the property on the right. This is the Great Lawn of the Windward Community College Campus. A follow up with the Division of Historic Preservation(DHP) in January 2016 revealed that the Hawaii State Hospital(HSH) has not yet submitted the required documentation to the DHP. The HSH does not have approval to proceed with the demolition of the Bishop Building. Therefore, the statement in the PIG report that the HSH has approval to proceed is incorrect.